It just occurred to me that the date for the Run for the Warriors 10K on Sunday isn't random. This race, held on the Sunday closest to Veteran's Day, is an inspiring event. When I signed up last year I imagined it to be the typical Long Island local race, with ~500 runners and the usual low-key staging I'd come to expect from those events. When we arrived on race day, I was astounded to see the large crowds, a rock band playing and tented grounds that were impressively decorated with a patriotic theme. 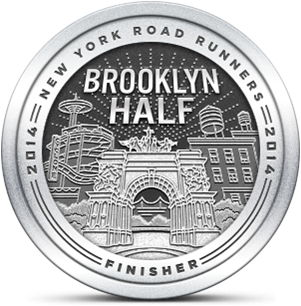 Last year there were about 2,000 runners split between the 1 mile, 5K and 10K distances. The 5 & 10K races started together and we split our routes after a mile or so. There were many servicemen and women running in their fatigues. One group of Marines opted for matching tees and shorts and others wore dress uniforms and carried their flags as they ran. The most impressive runners were those soldiers who carried full packs and ran in combat boots. I'm guessing this was to show solidarity with their brethren overseas who were on active duty. One soldier clearly demonstrated that point by running with a full sized dummy dressed in combat fatigues. Overall, the race was great, but two things I hope they do differently this year is expand the area for parking and provide more than five Port-O-Potti's for a crowd that numbers in the thousands.